We have some variation of these potatoes at least once a month. The ingredients are usually in our kitchen making them a quick answer to “what’s for supper?” They are a type of comfort food that everyone eagerly enjoys at our house. Change the veggies as desired; try cauliflower, grated carrots, peas, asparagus, etc. 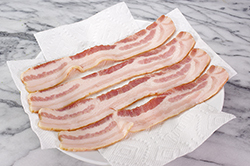 Substitute finely diced ham or smoked turkey for the bacon. The variations are endless, but always quick and satisfying! 2. Remove the florets from one broccoli stalk, and cut into smaller floret pieces. Dice the pepper. Place the florets and red peppers. Top with the slices of garlic and dot with butter. Add 1-2 tablespoons of water to the dish. Cover with a microwave-safe lid. Microwave for 2-1/2 minutes. Toss and stir. Microwave an additional 30 seconds or until the broccoli is a bright green and the stems are tender to the tip of a knife. 3. Scrub the potatoes, pat dry. Pierce each potatoes 3-4 times with the tip of a sharp knife. 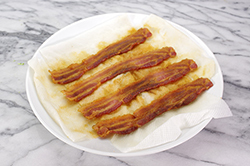 Place in the microwave at the edge of turntable on opposite sides. Cook for 4 minutes. Turn the potatoes over (bottom is now the top), and turn them around, (the inner side is now the outer side), and cook for an additional 4 minutes. 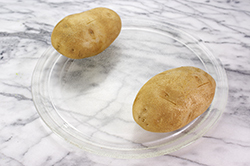 Cooking times will vary based on the size of the potatoes; check for doneness by piercing the center with a knife. If additional cooking time is required, turn the potatoes once again and cook in one minute increments checking at each interval. 4. 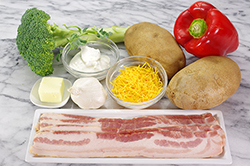 Place the potatoes on dinner plates, cut the potatoes open, top with steamed broccoli and red peppers and cheddar cheese. 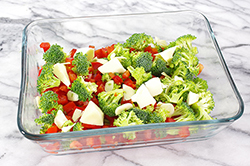 Place each plate back in the microwave for an additional 30 seconds to re-warm the veggies and melt the cheese. 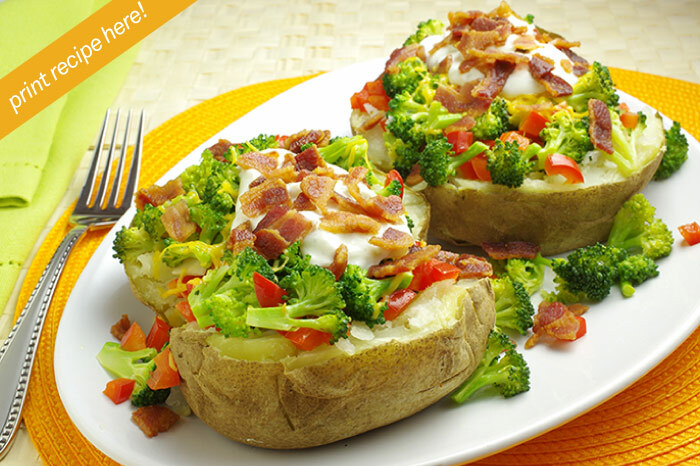 Dollop each potato with sour cream and crumble the cooked bacon on top. Enjoy while steaming hot!